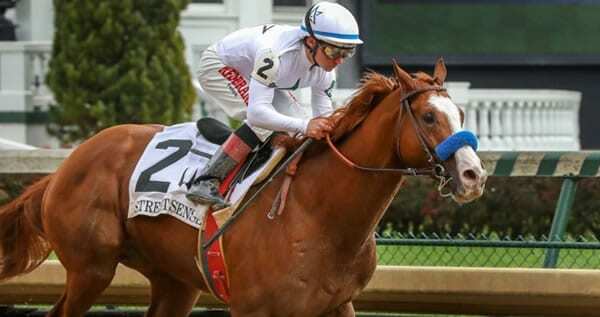 The 2019 Arkansas Derby-G1 should be a great race, with at least three major Kentucky Derby contenders and a nice cast of longshots for your superfectas. Morning-line favorite Improbable made his first start since winning the Los Alamitos Futurity-G1 in the first division of the Rebel Stakes-G2 and was wide throughout before taking over the lead in early stretch and just failing to hold off fellow Arkansas Derby entrant Long Range Toddy. Both Improbable and Long Range Toddy stalked a three-horse bid battle on the final turn in the Rebel, but Long Range Toddy had to wait a bit behind horses before rallying to catch Improbable and win by a neck. Long Range Toddy was on the lead early in the Rebel but was taken back to stalk a forced pace inside in the Rebel, where he rated nicely before making his run. Considering that Improbable is making his second start since December, and the fact that Long Range Toddy has now learned how to make his own advantageous trips, these two will be tough to separate in the Arkansas Derby. Omaha Beach took the measure of a tired but gutsy Game Winner by a nose in the second division of the Rebel Stakes after pressing the pace from the outside, opening a short, clear lead on the final turn, increasing his lead to daylight in early stretch and just holding on to win. That earned him a 96 Beyer Speed Figure, one point better than Long Range Toddy received for the first division of the Rebel, and that makes him a win contender here. Galilean hopped at the break in first division of the Rebel Stakes, pressed outside early and then ended up in a bid battle between horses on the final turn, which helped set the race up for winner and fellow Arkansas Derby entrant Long Range Toddy, as well as Rebel runner-up Improbable. Galilean won the bid battle but was no match for the top pair in the stretch. Still, that was his first start in open company after winning three of four starts in restricted stakes, and he fits the angle of the second start on the class raise after a good effort. A bit of a sleeper for the trifectas and superfectas is Jersey Agenda, who was steadied on the first turn of the Southwest Stakes-G3 two starts ago before dueling and fading to finish eighth beaten 10 lengths by Long Range Toddy. He came back in the second division of the Rebel Stakes, and after showing speed he was in good position stalking a forced pace between horses, but on the final turn, he was forced to check, lost his action, and by the time they turned for home he was last. He then rallied to pass horses and finished fifth. While he was beaten 10 ¼-lengths by winner Omaha Beach and runner-up Game Winner, he was only beaten two lengths for third money, and he was still trying at the end. He may not be good enough to match the top three in here, but he’s definitely better than his last race. The last horse we’ll mention is Country House, who finished second in the Risen Star Stakes-G2 for top trainer Bill Mott and then came back to finish a disappointing fourth beaten 6 ½-lengths in the Louisiana Derby-G2, after stalking outside and making a nice wide move on the final turn to be in striking position. He finished evenly when it counted in that race, and it almost seems as if he has been asked to do too much too soon in his career. Still, he could rebound with a better performance here if the top three go at each other on the final turn. The race sets up with Gray Attempt, Galilean, Jersey Agenda and maybe even One Flew South vying for the early lead, with Omaha Beach likely pressing outside. Improbable breaks from Post 1 and will have to make some decisions early. Can he stalk from the inside and still run well? He did it from the outside in his last, but he’s also getting blinkers on, so who knows what that might do to him early. Long Range Toddy will make his own trip breaking from Post 11 and tracking the pacesetters. Country House should get a similar stalking trip from Post 8. He’ll need improvement plus a big battle on the final turn to win this, but he might just get it. Improbable and Omaha Beach should still be around after the smoke clears on the final turn and they’ll have to fight with each other all the way to the wire while trying to hold off Long Range Toddy and Country House. The latter two horses will be the value plays.